Weather is changeable - from hot Armenian summers to cooler mountain climes so pack for both! Welcome; single supplement may apply for single rooms. Accommodation, transfers, flights (if booked), tour guide, listed activities. 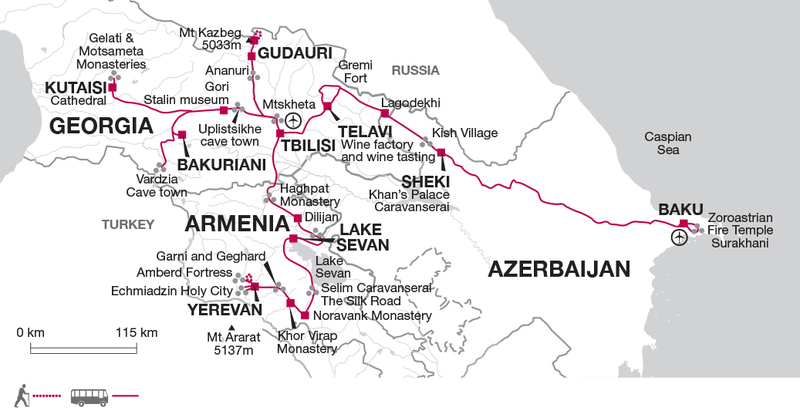 Georgia, Armenia and Azerbaijan are a cultural treasure trove, not only for their historic sites but for their traditions and heritage. We always want to show you as much of the real country as we can so we employ a local tour leader and variety of local guides who can really bring the culture to life for you in an authentic way. Using local guides and crew is consistent with our policy to generate local employment and deliver direct economic benefits to the areas we are traveling in. We also do this by using locally owned hotels, spreading our business to a variety of local restaurants.